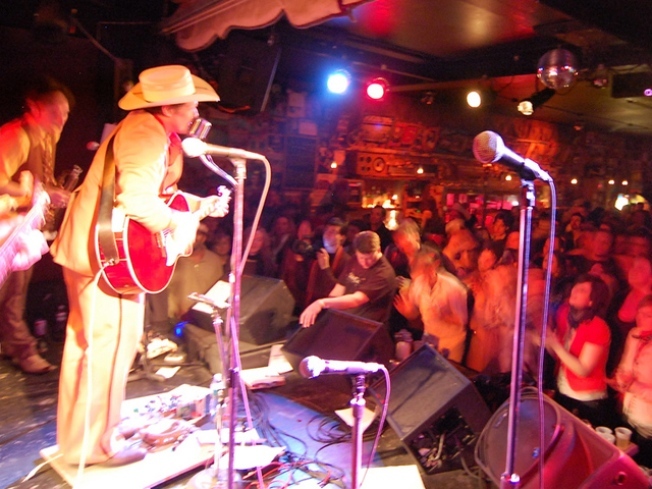 The 6th Annual Brooklyn Country Music Festival comes to Southpaw, boots 'n all. BRAND ‘EM: Park Slope's Southpaw welcomes three nights of absolute torch and twang as the 6th Annual Brooklyn Country Music Festival yeehaws into town. Bands like The Woes, Alex Battles & The Whisky Rebellion, and Jessica Rose & The High Life play tunes from honky tonk to neo-billy, proving the genre’s alive and well. Schedule varies. GO “WEST”: In this week’s installment of the massively popular In the Flesh naughty literary series hosted by "Penthouse" editor Rachel Kramer Bussel, the gaggle of readers includes Amy Sohn, who’ll present her just-out novel “Prospect Park West,” a gimlet-eyed chronicle of our era of strollers and yuppie ennui. Happy Ending, 7:30PM. GREAT SCOT: Amidst all this Leno-will-save-TV hoopla, late-night gem Craig Ferguson has been plugging wryly away, proving time and time again that the after-hours talk form is far from stale (if the host knows what he’s doing). He reads from and signs his book “American on Purpose: The Improbable Adventures of an Unlikely Patriot” – a memoir from blue-collar Glaswegian beginnings to kleiglights -- at the Union Square Barnes & Noble at 7PM.